Last Thursday, 18th April 2013, saw the opening of Mario Testino’s exhibition Alta Moda, at his cultural institute in his home of Lima, Peru. 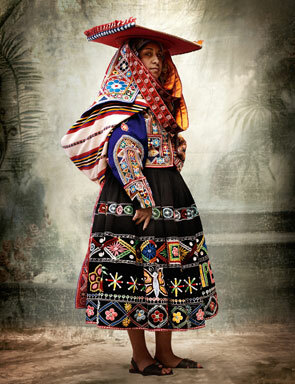 Testino’s Alta Moda (2007–2012) is a series of never before seen photographic portraits of Peruvians in traditional and festive dress from Cusco, one of the highest regions of Peru. Guests at the opening included model and philanthropist Natalia Vodianova, and American Vogue’s International Editor-at-Large, Hamish Bowles.